Last Monday I showed you our guest bathroom makeover. 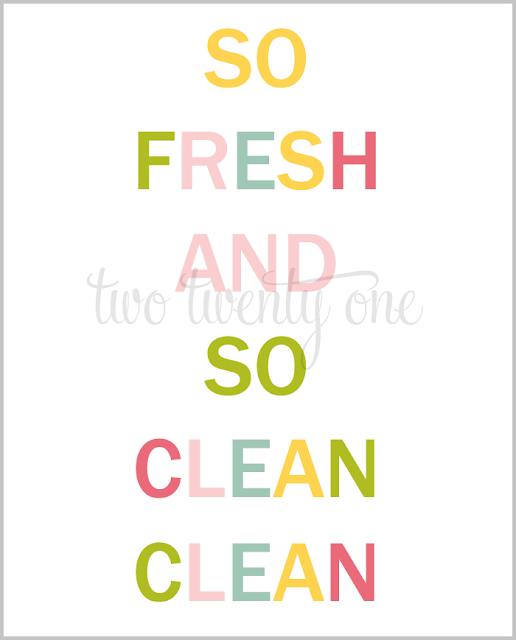 Well, I’m back today to share the So Fresh, So Clean bathroom print with you. The print is an 8×10. You can print it at your house or at a local print place like Costco or FedEx Office. I recommend printing on card stock. Please don’t ask me if you can print it at specific stores because I don’t know. Call the store and ask. There was your Chelsea keeps it real moment of the day. Click on the image to go to the download page. Don’t worry, the two twenty one watermark and grey border will not be on the download version. Interested in other colors? Fantastic! I’ve got you covered. I’m offering more colors in my Etsy shop. The $3.49 digital downloads (you download ’em, you print ’em) are 8×10.If you see one you like below, click on it and it will take you to that listing in my Etsy shop. I’m not down with these hip songs….because I’m old…it happens. Oh wow, these are great! I love ways to bring art into the bathroom. I would also LOVE to share the link to your printable in my next Printable Roundup if you didn’t mind. What a great printable Chelsea! I LOVE your bathroom makeover! And the free printable is so awesome 🙂 Thanks a bunch!!! thank you so much for this printable!! i love it! Thanks! I plan to use this for my bathroom!